Battling anti-farmer tag, govt gets ready to highlight achievements in agriculture sector on its fourth anniversary. New Delhi: Last week when B.S. Yeddyurappa resigned as Karnataka Chief Minister, his parting speech focused on the state of agriculture and what his party will do for the welfare of farmers. The emphasis on agriculture wasn’t a one-off. Yeddyurappa was merely echoing what the Narendra Modi government is planning to do as part of its strategy to win back farmer support ahead of the 2019 Lok Sabha elections. So, on May 26, when the Central government celebrates its four years in power and the ministries present their report cards, one ministry — the Ministry of Chemicals and Fertilisers — will be in focus. The reason: Its tagline — Farmer’s India — Kisan Ka Maan – Desh Ka Samman, Khet se Khane ki Thaali Tak. The BJP has been pushed into damage control mode over the agrarian crisis in the country after suffering electoral losses and relentless protests. In Gujarat, Modi’s backyard, the BJP put up a poor show in the state elections late last year, dropping to less than 100 seats in the assembly. In neighbouring Rajasthan, the party lost three bypolls in January this year. The losses, in part, have been attributed to farmer distress in these states. In Maharashtra and Madhya Pradesh, both BJP-ruled states, farm discontent boiled over, leading to massive demonstrations and even firing by police on protesters. 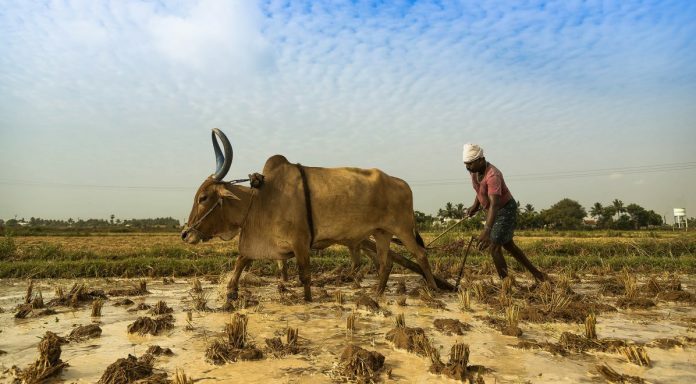 Fighting the anti-farmer tag, Prime Minister Modi has promised to double farmers’ income by 2022. With farmers on the Modi government’s agenda, the Ministry of Chemicals and Fertilisers is set to come under the government lens. Its tagline highlights its efforts to increase farmers’ income. “We need to showcase the work we have done to ensure that they have been taken care of. This tag line sums up the achievements,” the source said. The BJP is also set to urge its leaders to focus on the ministry’s work while it has roped in its Kisan Morcha members to further spread the word. Sources in the ministry said the data collected from the ministry has been collated and will be sent to party leaders to spread it among the farmer community. For this, a detailed plan too has been formulated keeping in mind the approaching Lok Sabha elections. Dr Shambhu Kumar, national secretary of the BJP Kisan Morcha, said the government’s achievements in the agriculture sector are set to be published as an information booklet in a number of languages. There would be hoardings and advertisements in every district citing what the Modi government has done for farmers, Kumar added. “It is for the first time that 52 per cent of the budget has been allocated to farmers’ wellbeing. The government has also started ensuring subsidy to farmers and working on ways to improve their income,” he said. In its agriculture pitch, the Modi government is set to state that it has ensured minimum losses to farmers. It will highlight its budget allocation for fertiliser, urea and nutrient-based subsidies, which it says has risen by almost 8 per cent to Rs 70,000 crore. The government is expected to point out that the direct benefit transfer (DBT) of fertiliser subsidies was completed by March 2018. The Modi government is also banking on its efforts in urea production and disbursal. The fertiliser ministry says the highest ever production of 245 LMT of indigenous urea was in 2017. Retailers and farmers in all districts also reported ‘nil shortage’ of urea due to the mandatory neem coating. On May 25, 2015, government made neem coating of urea compulsory to prevent its diversion to the industrial sector. The government will also highlight the introduction of 45-kg urea bags with a MRP of Rs 242 per bag, replacing the replacing 50-kg bags. The government has also reduced cross-border sale of Urea to Nepal and Bangladesh from Kishanganj. Another area that the government is expected to play up is the proposed investment of Rs 40,000 crore to revive the defunct fertiliser units in Gorakhpur, Sindri, Talcher, Ramagundam and Barauni. The Ramagundam project is likely to be commissioned by December 2018, the Sindri and Gorakhpur units of FCIL and Barauni unit of HFCL are likely to be operational by October 2020. The Talcher project is likely to start production by 2021.